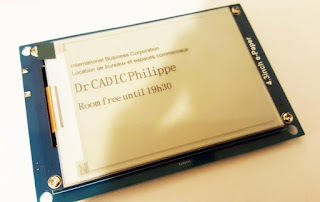 E-Paper, E Ink, or one of the several other ways to compose/capitalize this class of device is likely best-known in Amazon’s Kindle and other eBook readers. And why not? This technology is easy on the eyes, and only uses power when it changes what is displayed. It’s such a neat concept that one would think it would be used in more projects. It does, however, have a few drawbacks like the fact that it generally doesn’t come in color, and doesn’t refresh fast enough for any sort of acceptable animation. The other important drawback from a DIY perspective is that they are relatively difficult to control. As seen in this Hackaday.io writeup, you can’t simply tell one pixel to be a certain shade of gray and expect it to work without some serious fiddling.